In this section, we look at small-scale power generation. As time goes on, you will encounter this approach to generating power, called distributed generation, more and more. Lower greenhouse gas emissions. This benefit is the result of using more efficient and/or renewable energy sources. Reduced power distribution infrastructure. With power being generated nearby, less power distribution infrastructure is required. Peak shaving: Peak shaving is the leveling out of power consumption over time. Peak shaving is discussed later in the chapter. Fuel Flexibility: DG allows the customer to choose between several fuel sources based on cost and availability. Distributing generation can take many forms. It can be as simple as adding a couple of solar panels on a residence or as complex as implementing a variety of power generating alternatives for an entire industrial complex. DG units can produce from a few kilowatts to hundreds of megawatts. Some DG installations include renewable and alternative energy sources, while others do not. 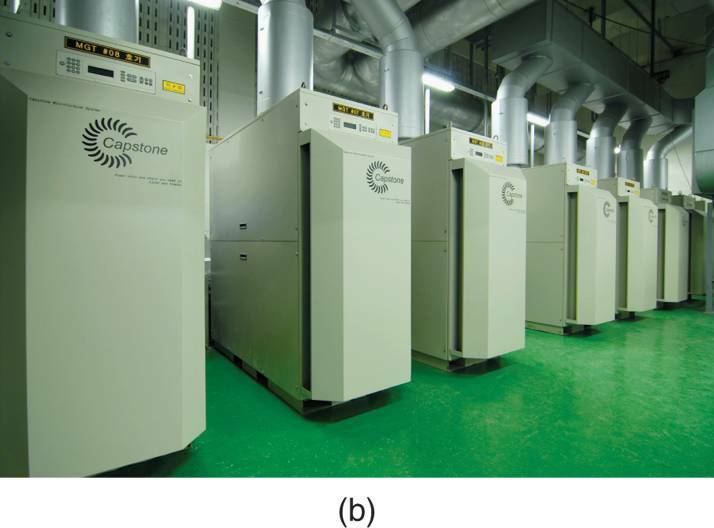 Let’s look at some of the more popular forms of distributed power generation technologies. This technology has been around for years and is still the most popular DG electricity source. There are many reasons for the popularity of Reciprocating Internal Combustion Engines, including Low cost per kilowatt produced, low maintenance requirements, and high reliability. Diesel was once the fuel of choice, but natural gas (NG) took its place because it is cheaper and much cleaner. There are many dual fuel generators that can run on either diesel or NG, and older diesel units can be retrofitted for dual fuel operation at a reasonable cost. Lean burn technologies and improved emission controls also make the reciprocating engine a reasonably green choice. The efficiency of these units varies depending on size, fuel, and whether cogeneration is employed. The larger the power plant, the higher the efficiency. Cogeneration is the capture and use of the waste heat produced by a generator for space and/or water heating. When this technology is employed, reciprocating engines can approach 80% efficiency. Combined cycle power generation and the use of waste heat to drive a steam turbine to produce more electricity can also be employed with these units. Reciprocating engines can be used as a prime power source, as an onsite peaker plant, or as combined heat and power (CHP) source. A lean burn 1.25 MW NG generator is shown in Figure 1. 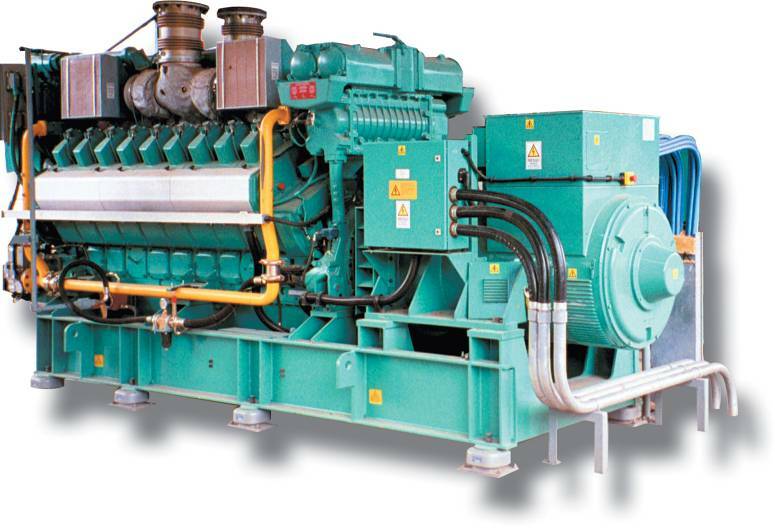 Figure 1: A lean-burn 1.25 MW NG generator. Definition: A power generating machine, capable of burning any number of fuels, that in its simplest configuration consists of a compressor, a combustion chamber, and a turbine. Gas turbines operation is based on the same technology as a jet engine. 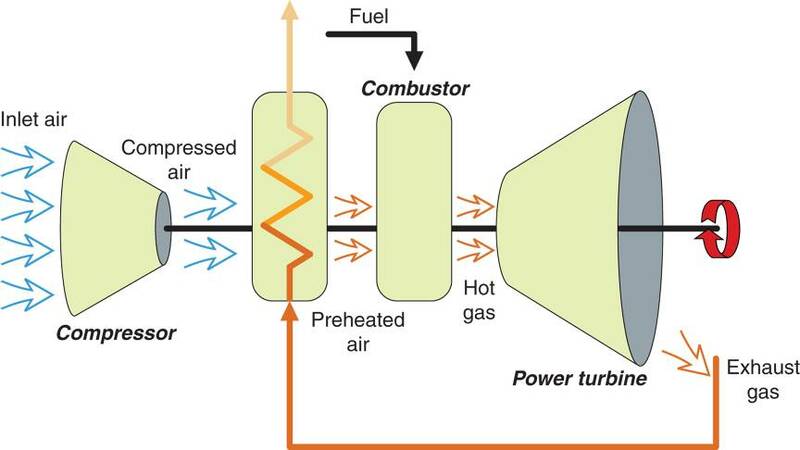 The basic gas turbine consists of a compressor, a combustion chamber, and turbine as shown in Figure 2. Figure 2: A basic gas turbine. Gas turbines can burn a variety of fuels, from natural gas to methane produced using Biomass (vegetation, plant matter or agricultural waste). Biomass: A term used in reference to the production of methane from the decay of vegetation, plant matter, or agricultural waste. Industrial gas turbines can generate from tens of kilowatts to hundreds of megawatts. They can reclaim heat and using it for combined cycle operation. They can also preheat the compressed air to increase combustion efficiency. Intercoolers added to the air intake can further increase combustion efficiency. This process of burning fuel with compressed air and then using the expanding gases to drive a turbine is called the Brayton Cycle. Gas turbines have advantages and disadvantages when compared to internal combustion engines. On the plus side, they are lighter, have a smaller footprint (require less square footage), have less downtime for maintenance, and have lower emissions. They can also burn a wider range of fuels than internal combustion engines, and now nitrogen oxide emission control technology promises to make them even greener. On the negative side, they take longer to power up and power down, and they are less efficient for outputs below 2MW. Gas turbines are particularly well suited for large cogeneration applications. A much smaller version of the industrial gas turbine is the microturbine. A Microturbine works on the same principles as its larger cousin. It has output capabilities ranging from tens of kilowatts to a few hundred kilowatts. Microturbines are not quite as efficient as larger industrial units, but as demand increases, new technologies should bring costs down and efficiencies up. Microturbines are becoming popular in a variety of applications. For example, one major natural gas producer is diverting raw natural gas from the wellhead to power microturbines. The microturbines, in turn, supply the electrical power for all the onsite pumps and other equipment. Microturbines can burn even poor quality fuels such as unrefined NG, low methane biogas, and even vegetable oil. 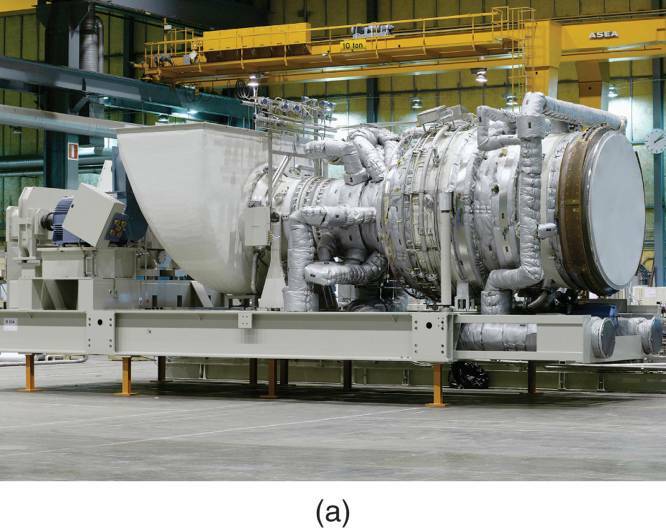 An industrial gas turbine and an array of 65 kW microturbines are shown in Figure 3. Figure 3a: An industrial gas turbine and an array of 65-kW microturbines. Figure 3b: An industrial gas turbine and an array of 65-kW microturbines. Photovoltaic cells (PV) convert solar energy (sunlight) into electrical energy. They produce no greenhouse gases or particulates, are quiet and reliable, and require very little maintenance. As a small-scale power generating alternative, PV cell arrays can be scaled to just about any size, depending on customer requirements. On the negative side, PV cells are still expensive and, of course, work only when the sun shines. However, costs are going down rapidly as new technologies are developed and mass production reduces costs. A very basic description of PV cell operation follows. The base material for PV cells is silicon—a semiconductor that has four valence electrons. Two wafers of silicon are treated with two different elements called impurities. One impurity changes silicon into an N-Type Material that has excess free electrons. The other converts silicon into a P-type material that has excess valence band holes. When light hits the component, some photos release energy in the N-type material. Others pass through to the P-type material, generating free electrons that pass to the N-type material. When this occurs, an electron imbalance is created between the two materials. This imbalance causes electrons to flow through the lamp (load) and back to the P-type material. This flow of electrons (DC) continues as long as light hits the component. Figure 4: Photovoltaic cell operation. PV power generation is growing rapidly. It is a very green source of electricity but has some inherent problems. Most obvious is that it works only when the sun is shining, so it has geographic, and possibly seasonal limitations. Also, it produces direct current (DC), so an inverter is required if PV generated power is to be integrated into buildings existing power distribution system. An Inverter is a circuit that converts DC to AC. Inverters can cost as little as a hundred dollars or as much as several thousand dollars, depending on the inverter’s current capacity and application. And like any device, they are not totally efficient. In some applications, efficiencies can approach 90% but if excess PV power is sold back to the grid, losses can approach 50%. Definition: A device that generates power through a chemical reaction involving hydrogen. Fuel cells hold a lot of promise, although they still have some problems. There are currently several thousand fuel cell installations worldwide. On the plus side fuel cells are very quiet, they produce almost no greenhouse gases or other contaminants, and, if waste heat is captured and used, efficiencies can approach 80%. On the negative side, fuel cells are expensive since platinum is one of their critical components. Costs are expected to decrease over time as the technology evolves. Fuel cells generate power through a chemical reaction involving hydrogen. There are several different types of fuel cells. They are named based on the electrolyte they use—phosphoric acid, alkaline, proton exchange membrane (PEM), solid oxide (SOFC), and molten carbonate (MCFC). PEM cells are the type favored by most hybrid electric car manufacturers. They can respond very quickly to change in load demand, but they are currently limited to outputs under 10 kW. The structure and operation of a PEM fuel cell are illustrated in Figure 5 . Figure 5: PEM fuel cell structure and operation. There are three subsystems in every DG installation: the generator, the load, and the rest of the equipment required to make the whole thing work. This third subsystem is usually referred to as the balance of system (BOS). Exactly what makes up the BOS is determined by the type of generation and whether it is connected to the grid. As you might expect, stand-alone systems have the simplest BOS requirements. The most complex BOS is found in installations that take power from the grid and sell power back to the grid. Utilities usually have very strict protocols about voltage stability, frequency, and harmonic content. • A voltage regulator to maintain a constant voltage. • Power conditioning to keep the AC as pure as possible. • Power storage (batteries, etc) if required. • Safety equipment, such as surge and overvoltage protectors and disconnects. This is only a very limited list. One supplier offers over 2000 BOS components. Distributed generation, the production of electricity at or near the customer’s site, should produce lower greenhouse gas emissions, reduce power distribution infrastructure, level out power consumption (peak shaving), and increase fuel flexibility. a. Cogeneration is the capture and use of waste heat for space and/or water heating. b. Combined heat and power (CHP) is another name for cogeneration. The Brayton cycle is the process of burning fuel with compressed air and then using the expanding gases to drive a turbine. Microturbines are very flexible. They can burn a variety of poor-quality fuels such as unrefined natural gas, biogas, and vegetable oil. 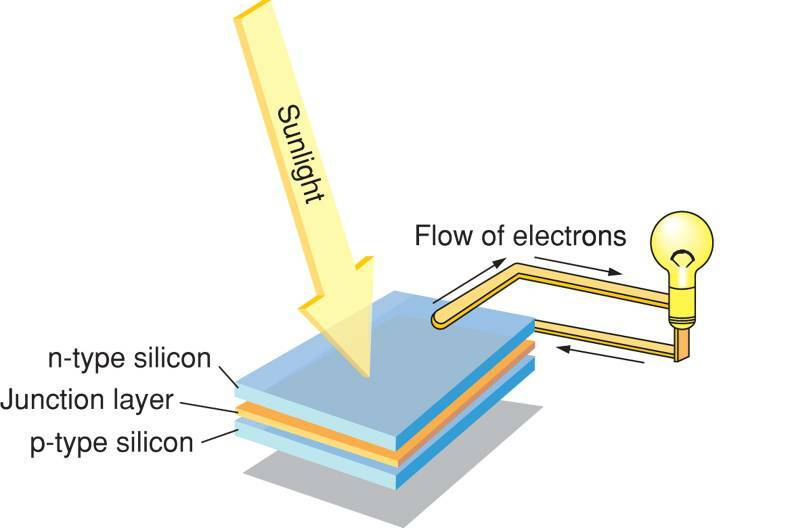 A photovoltaic cell is constructed of two types of semiconductor material called p-type and n-type material. When joined, these two materials form a junction layer. When photons strike the PV cell, free electrons are produced in the p-type material which migrates to the n-type side of the junction. This creates a potential difference. If a current path is provided between the layers a DC current will be produced. Building-integrated PV is the technology that incorporates PV cells into common building materials such as roofing shingles. This could result in buildings producing their own electricity. 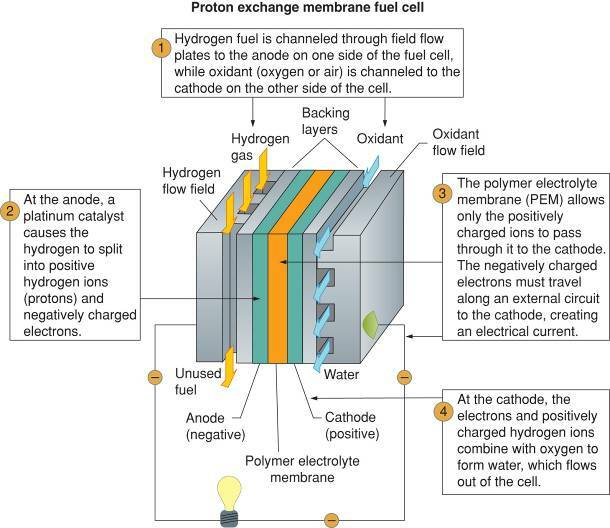 Fuel cells employ a chemical reaction using hydrogen to generate power. The balance of system refers to the components in a DG system that are not the generator or the load. Voltage regulators, inverters, and switching systems are a few examples.